Injuries in youth sports are a serious problem in athletics today. The number of young athletes in pain or needing surgical repairs in high school is at an all-time high. Many athletes begin icing when in college or perhaps even high school. But there is no reason that young athletes would not experience the same benefits as the older athletes do. 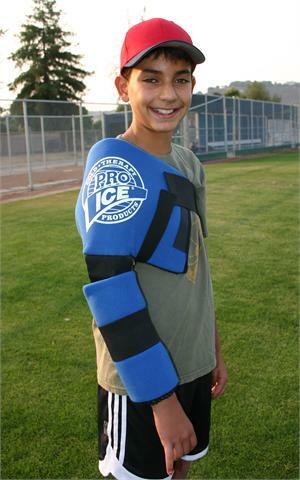 Pro Ices youth shoulder/elbow wrap is the leading cold therapy system on the market today, far outperforming any cold pack. While the cold therapy shoulder/elbow wrap was designed for pitchers, any number of young athletes would benefit, especially those whose repetitive motions affect the rotator cuff, upper arm or elbow. Apply ice to receive nearly instant pain relief after an injury without the worries that come with over-the-counter drugs. Ice after exertion to prevent repetitive stress injuries. This will in turn extend the childs potential playing career, whether a college scholarship is a potential or a lifelong love of the game is maintained. Simply place this reusable cold pack around the shoulder and elbow. The windowpane format will conform to the body and the compression straps will boost the benefits of the cold therapy unit. The single ice insert will maintain a consistent temperature for an hour; extend the pain relief by adding the PI 221, shoulder/elbow ice insert, to your order. Once youve received your PI 220, place the reusable cold pack in your home freezer for a few hours, laying it flat if possible. You may freeze the insert inside the wrap or on its own. Then, simply apply the cold therapy wrap to the body. The ease and convenience of Pro Ice means there will be no drips and no need to rest while icing. The compression will hold the cold therapy wrap in place while the youth continues his or her daily activities. The youth model is intended for those up to 5 feet tall and weights of 80-120 pounds. For anyone larger, consider the adult shoulder/elbow kit, PI 200, below. 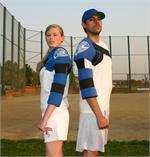 The Pro Ice PI 240 Pro Shoulder/Elbow Wrap is designed for the larger athlete and for post-surgical use. Just like the PI 200 Adult Shoulder/Elbow Wrap, the Pro model provides compression and cold on the rotator cuff, upper arm and elbow. .